Is it just us or is everyone feeling a little blue? No, we don't mean from these tropical showers that seem to refuse to leave the city; but variations of the cerulean colour. Inspired by Capri’s stunning sea caves and faraglioni (of which an image replica hides in the caseback), the electric blue-hued limited edition—only 30 pieces are available—features a 45mm satin-finished ceramic case and self-winding chronograph movement that offers 42 hours of power reserve. First created in 2017 to mark the 15th anniversary of the house’s beloved Tambour watch, the Tambour Moon gets a new look this year, now available in a deep blue dial. His and hers versions come complete with interchangeable straps, diamond-set horns and hour markers and steel cases, with an option of a quartz, self-winding or automatic movement. 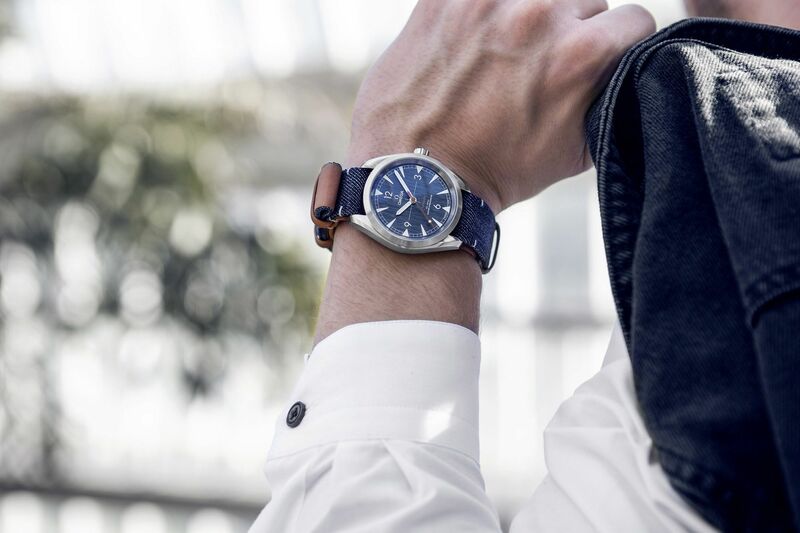 Now you can don your favourite fabric on your wrist with the Swiss watchmaker’s new Railmaster---a 2018 update to its 1957 original that echoed the choice of attire of the working class. A vertically-brushed blue jeans dial features indices and Superluminova hands . A beige seconds hand and transferred Railmaster indication call to the coloured stitching found in denim jeans. The watchmaker’s newest blue models—whether it be the Defy Classic that boasts the brand’s new Elite skeletonised movement, the Defy El Primero 21 Blue which offers the chance to admire its intricate mainplate through the dial, or the Pilot Type 20 Extra Special and Pilot Type 20 Extra Special Chronograph featuring new bronze cases—will ensure the globetrotter with an adventurous streak looks dapper on his or her journeys. Stylish, versatile and sturdy—and all for a good cause too. Boasting a 41mm case made of sleek black ceramic, a signature blue dial and a special engraving on the case back, the limited edition Pilot’s Watch Mark XVIII—only 1,500 pieces available worldwide—was especially launched this year to mark the 2018 Laureus World Sports Awards in Monaco in efforts to support Brazilian children and adolescents. Whether on its dials, movements or intricate finishing touches, the colour blue has always taken centre stage in the watchmaker’s timepieces—not least in its latest feminine Récital 11 “Miss Alexandra” timepiece and the triple time zone Récital 17 that boasts a seven-day power reserve. Delicate blue accents, found everywhere from the hands to Arabic numerals, straps, extraordinary moon phases to sapphire crowns, give the pieces the house’s trademark opulent touch. To announce the maison’s latest La Grande Vie collection, a trio of new creations spanning hues from fiery red to earthy green have recently been launched; but it is the lavish royal blue variation that proves to be the most versatile. Regal yet accessible, the models feature shimmering dials that come with elongated baton hour markers, 42mm titanium cases and beating automatic movements.